As I mentioned earlier this year, I'm fascinated by the second-book process, and I will have several guest posts this year on the topic. 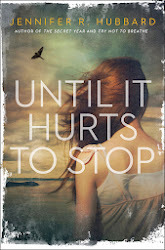 The latest one is by a brilliant and witty YA writer whose second book comes out any day now! The problem with getting your first novel published is that you have to then write your second novel. I know, a problem most people would like to have. But for many writers, Book 2 becomes the millstone. The albatross. The @#()* piece of @#()&*@ that just won't gel. I threw away 60,000 words' worth of misbegotten Second Books. And now that I can think about it without rocking and singing lullabies in a dark corner, I think I understand why. The first publishing experience made me forget that writing is about endless possibility. Because I wasn't yet published, I didn't spend my time writing the first book wondering if first or third person sells better. Not once did I rewrite a section because I knew my editor had just published another book with a similar scene. Drafting the first novel, I hadn't read any reviews worrying over the lack of character development, or the overdevelopment of the characters to the detriment of the plot, or the strength of the plot overshadowing the setting, or blah blah blah. The only voices in my head when I wrote the first book were my characters'. I was there, fully in the moment, devoted to writing that book. Everything was possible. Nothing was forbidden. And it wasn't until I believed anything was possible on book two, that book two actually came together. THE VESPERTINE was, once upon a time, the book I thought I should write. It was set in contemporary Indiana, it had a little magic, a little family drama, and a big romance. It was the appropriate book for my "brand". It catered to the library market. I was miserable writing it. I hated getting up, I hated opening the file. I hated that I wasn't so much writing a book, as carefully crafting some words to fit a bunch of market considerations. I got so discouraged, I threw it all away. Then I wrote the book I needed to write, the one that would make me all kinds of happy. In the beginning, my new version of THE VESPERTINE was a historical (doesn't sell!) serial killing (overdone!) vampire (market's too crowded!) novel. Ultimately, it became a gothic novel about a young woman who can see the future in the sunset, and a young man who seems to come and go with the wind. No vampires. No serial killers. But nonetheless, the book in my heart, a book I loved writing, whether anyone else would love it or not. But I hope people do—it comes out in March. I'm trying to remember as I revise Book Three, and start Book Four, all the lessons THE VESPERTINE taught me. Every idea has to have every possibility, if it has any possibility of becoming a novel. Business comes later. Today, it's just about the writing. Saundra Mitchell has been a phone psychic, a car salesperson, a denture-deliverer and a layout waxer. She's dodged trains, endured basic training, and hitchhiked from Montana to California. She teaches herself languages, raises children, and makes paper for fun. She's also a screenwriter and executive producer for Fresh Films and the author of Shadowed Summer and the forthcoming The Vespertine and The Springsweet. She always picks truth; dares are too easy. A while ago, I read a book about Rose Wilder Lane and how much influence she had had on the writing done by her mother, Laura Ingalls Wilder. * Rose was a writer herself, and according to this book, she had a heavy editorial hand in Laura's Little House books. From what I remember, Rose viewed the Little House books with a rather practical eye. They were nice, of course, and would find a modest audience, but they weren't exactly serious literature. I recall that Rose had a cherished ambition to write a really grand epic novel, or series. It would have breadth and depth, would cover everything: the ups and downs, the bitter and sweet of life. She never did write that epic. And the Little House books went on to become a phenomenon: still in print decades later, read by generations of children. Sometimes we think our work has to be so grand and significant, so elegant and high-minded and complex, that we despair of ever writing anything worthy. And all along, something familiar and true may be the story that really resonates with others. *I believe the book was The Ghost in the Little House: A Life of Rose Wilder Lane, by William V. Holtz, although I'm not 100% sure. I checked out the book in question from the Philadelphia library a few years ago, and I see that the Philadelphia library does have this book. One thing that's struck me, reading blog posts like this one by Book Chic and this one by Brian Kell and this one by Courtney Sheinmel and many, many, many more like it, is the ripple effect that people have on those around them. Maybe that ripple effect is more pronounced in the age of social networking; maybe it's more pronounced in the lives of writers, whose job is communication. I've now read dozens of stories about the ways in which L.K. Madigan touched her fellow writers, her readers, her agent ... people she met, and people she never met. The outpouring has been so strong that her husband has decided to keep her blog open; please follow this link to read his words. It emphasizes the effect we have, and can have, on one another. The time taken to share a kind word, answer an email, extend a helping hand, is time well spent. People remember those things and cherish them. I'm a writer, and my main body of work is novels and short stories. But I think the time I spend blogging and commenting on forums and answering email is valuable, too: not because I'm trying to build a "platform" or sell books, but because I'm interacting with people in a way that matters. Sure, internet time can involve some joking around and the sending of silly cat pictures, but 1) there's a lot more than that going on here and 2) sometimes we need silly cat pictures. Another untimely passing this week was that of a YA writer whom I didn't know at all, but whose novel I enjoyed: Perry Moore. A couple of years ago, Moore's book Hero won a Lambda Literary Award as a best novel for gay and lesbian young adults. I would bet it was greatly appreciated by gay and lesbian teens who hunger to see more characters like themselves in mainstream fiction, in addition to being appreciated by those of us who found it a fun read. The thing about writing is that we just never know where our words will go. When I was growing up, in the pre-internet age, I rarely had any contact with authors. I think I wrote one fan letter. I couldn't look at my favorite writers' websites, follow them on Twitter, comment on their blogs. I treasured their books, memorized their words, and they never had any idea. Even now, in the networking age, we will only ever see a small portion of reader response to our books and to the things we say online. Our job is to keep putting out words that say something, that mean something, and hope they find their home. I'm still valuing a fair amount of silence at the moment, and I'm afraid eloquence fails me when it comes to the loss of L.K. Madigan. When Lisa first went public with her cancer diagnosis, I blogged at that time about my interactions with her, and what she and her writing meant to me. Words fill an empty page (or nowadays, a screen). Writing is about finding a voice and speaking. Yet sometimes, silence feels right. The silence of contemplation, or planning. The silence of not knowing what comes next--or knowing but not being sure yet how to describe it. There are other silences, too: The silence that follows a major scene. The silence of a character who is about to face her biggest challenge. The silence of contentment, sorrow, puzzlement, anger, longing. Silence is a rest in music, a pause in an actor's speech. It's the white space between scenes and chapters, the space that counts as much as any sentence or paragraph. Sometimes it's waiting to write the next words. Sometimes it's acknowledging our inadequacy in the face of things that are bigger than words. Sometimes it's the emptiness of having poured everything out, and waiting for the pitcher to refill. The past couple of years, I've held a challenge on my blog to raise money for libraries (the aptly named Library-Loving Blog Challenge). Basically, I pledge money to my local libraries for every comment received on my blog during the challenge. I've also encouraged others to do likewise, donating to their local libraries, and many wonderful people have stepped up to do this. This year, I'm planning to do the challenge March 28 - April 2. I'll use my blog again, but this year I will also have a Twitter component. I'm not on Facebook, but if anyone wants to join in and coordinate a Facebook effort, I'm open to that. If you're interested in participating, please email me at jennifer[at]jenniferhubbard[dot]com or leave a comment with your email address below. You pick your own library, pledge amount, donation cap, and which days you want to participate. It's a lot of fun, and libraries are hurting worse than ever this year. I've heard it said that one motive for artists is often revenge--the chance to make a story turn out the way it "should have." The chance to disguise a real-life enemy as a fictional villain. The opportunity to create something so amazing it "shows the world" what they overlooked. I don't think revenge operates much in my own creative process. In fact, I rarely even use anger as a motivator. Everything I write when angry tends to come off priggish and didactic; apparently my Angry Writer Side cannot resist the soapbox. It's one reason I rarely rant on this blog. Some people can do angry writing in a very entertaining manner; some use angry writing to make great points. Nora Ephron's novel Heartburn is a perfect example of a revenge-based novel that really works as a piece of fiction. For me, inspiration comes from another place. I seem driven to try to make human behavior understandable. Not necessarily justifiable or condoned or celebrated, but understandable. Are you ever motivated by revenge or anger? One way for writing to go in unexpected directions is to violate people's assumptions about familiar storylines. Another is to break social norms. For example, let's say we have a budding romance between characters who didn't hit it off right away--but the reader has reached the point where it's obvious the characters like one another. In this storyline, there will typically be a lot of friction and a lot of denial, which can work just fine. After all, in real life people strive to protect themselves in just that way. But sometimes a reader gets tired of watching this dance. Why not have one of the characters reach the breaking point and make a full-out, over-the-top play for the other? Or, on the other hand, why not bring in an alternate love interest for one of them--not someone the character pretends to love to evoke jealousy in the other, not someone the reader can tell is really shallow and will disappoint the main character eventually--but a real, viable challenger? These are just examples off the top of my head. Of course any twists must fit the characters, plot and theme. There shouldn't be random twists just for the sake of fooling the reader. My point is to encourage writers to think: What could happen next? What else could happen next? What usually happens in this situation? Is there a different way to go? How would these characters really act? Is the reader too far ahead of the characters here--will the characters seem stupid if they go on like this much longer? Where's the fresh ground, the fresh angle? I suspect that the descriptive/prescriptive divide is a particularly contentious one in the world of children's literature, because it depends on basic philosophical differences about what stories should do. Some think that stories should reflect the world as it is, and should give kids a safe place in which to think through challenging situations. To ask themselves, "What would I do in that situation? Did the characters' actions work for them? Why or why not? What else could they have done?" This is the descriptive school. Others think that stories should reflect the world that ought to be, and should give kids a safe place that represents the ideal situation. This is the prescriptive school, and its adherents tend to be more concerned with concepts such as role models. An author of the descriptive school might write about a character with, say, a drug addiction, while a prescriptive author might shy away from including such a character. In real life, both authors may be equally opposed to drugs. The prescriptive author might say that kids need to be protected from all mention of drugs, for fear of glamorizing them. The descriptive author might believe that kids need to be protected from real drugs, but that stories in which characters encounter drugs are useful in helping readers figure out what they want to do when they're eventually faced with the real thing. Another way to look at it: Prescriptive authors may think the world is tough enough, and books should provide a pleasant haven from the grit of real life. Descriptive authors may think that readers are comforted to know they're not alone in sometimes having negative thoughts and feelings, scary experiences, tough challenges. My own writing tends to fall into the descriptive school, but I think it's useful to have both kinds of books on our shelves. Last night I posed this question on Twitter: Do you prefer a book that makes you laugh or cry? I've been thinking about that message: both. I think we appreciate books that have the emotional richness of life. In life, we often share a smile or a teary laugh even at funerals; we may feel a pang of sadness even at the happiest times. We deal with tragedies and comedies back to back, and sometimes simultaneously. It makes me think that a good test for a writer to apply to a manuscript is this: Does this story hit only one emotional note--and if so, is that what I really want? Or does it evoke several different emotions? Recently I issued a challenge on this blog--to buy a book of poetry (or a magazine with poetry in it, or a verse novel). My own assignment for the challenge was to purchase and read John Grandits's book Blue Lipstick: Concrete Poems. I was taught in school that concrete poems are poems written in a shape that reflects their topic. A poem about a circle would be written in circular form, to give the simplest example. And I thought Grandits's concrete poems would be that simple. If you read this book, get ready to turn it every which way in your hands. It starts with the poem on the cover, which is written around the edges of the book cover (mimicking the frame of a mirror. The background on the cover's center is a silver mirror finish, though you can't tell from the above picture). There's a poem about volleyball in which the poem's lines zoom back and forth across a net. There's a poem about going all over town that follows a meandering path reminiscent of Family Circus cartoons. There's a poem in the shape of tangled hair. This book isn't just about being dazzled by the wild shapes Grandits comes up with. The poems' narrator, Jessie, is a teen with a vivid voice--sometimes snarky, sometimes enthusiastic, and every emotion in between. The unusual design, the shortness of the book, and the strength of Jessie's voice make this book a good candidate for reluctant readers. It's also good for inspiration--even for us non-reluctant readers--because it's fun and different. Something about engaging with this collection made me want to try new things. Best of all, it reminded me of the bottom line about creative writing: It can be fun! Whatever else you do today, find a moment to play. In other news, I visited the blog of Judith Graves because, like me, she's doing a series on writers and the "second-book experience," and I'm her first guest in that series. I even dropped some major hints about what my second novel contains. Thank you, Jenn, for inviting me to your place. It’s so exciting to see how others live, sneak a peek in the medicine cabinet … check out your bookshelf. You asked me to write about a vacation memory. After all, vacations are fodder for story ideas. I considered giving you a boring spiel, but then I thought, “Hey, I’m a writer. I can make it fun (I hope) and maybe show how to write in first person, past. Something I have never done.” The names have been changed, but not the event. So here we go … Miami, Florida, December 29, 2002 . . .
We stood in the doorway. Karen’s mouth agape, my eyes wide, and India’s mouth tilted in a smirk. The black lacquer furniture was ripped out of a 1980’s home décor catalogue. This was free, I thought. It’s the only way I could afford to come to Miami for New Years. I took a few steps, crawled across the king-size bed, wedging myself between the bed and the closet. India wedged herself between the dresser and other side of the bed. Karen remained in the doorway. “Well, this will make an even better vacation story,” I said. “I was expecting—” Karen started. “Something from this decade,” India finished. India unpacked our food supplies, placing them on the dresser. “I get first dibs on the bathroom,” I said crawling across the bed and squeezing past Karen. I flicked on the bathroom light, and my hand reflexively covered my mouth, stifling a scream. You should know something about me. I am a tad … just a smidge … germ-phobic. Meaning? I don’t use antibacterial wipes after I shake a hand. But I do have images of cat-sized germs lunging at me; their black claws tipped with dried blood ready to tear into my flesh. So, when I saw a bathroom that Clorox would shy away from and met one of the locals--a LARGE roach--my first instinct was to scream. I heard angry voices—Karen’s in the fray. The thick Jamaican accents disguised words, but not their meaning. Karen yelled for me. Thank God, a reason to leave this … this … the roach stopped and glared at me. I shivered and turned off the light. “We have to go,” Karen said. “What? Why?” I said, glancing at India; she was talking on the phone, asking about hotel reservations. I glanced at our six-pack of water and unopened Little Debbies. Seriously? Did the woman not know she already had a squatter in the bathroom? So, it’s your turn. Share a moment from your vacation. Or tell us what Tracy should've named the roach! "'When I die, the world will be annihilated, as far as I'm concerned.'" This one perfectly captures the horror that grips us when we consider our own mortality, the fear that swings us into carpe diem, the bittersweetness of realizing how short life is. "She had the neophyte's shock of discovery that, outside of tracts, conservatives do not tremble and find no answer when an iconoclast turns on them, but resort with agility and confusing statistics." (In this quote, "conservative" doesn't necessarily mean politically conservative, but any adherent of the status quo.) This one makes me laugh. How often have we believed we could bring someone over to our way of thinking with an argument that seems so obvious to us, crystalline in its flawlessness! And how often has our opponent in the debate failed to yield, expressing the argument in entirely different terms. "'What if you do drop back? You'll have had the adventure. Don't be too meek toward life! Go! ... Try everything!" Here, one character urges another to try his wings and follow his dreams. He can't really lose, this statement says--because even if he doesn't succeed, he'll know his capacity. He'll never have to wonder. This is why I read and write: to find the sentences that make me feel communion with another mind. Even if it's the mind of someone I've never met. "... I believe in not being Roget's trollop, parading words and tossing off bravado for an audience." Here's how it goes: Someone asks if YA with male main characters is hard to get published, or says that it's difficult to find such books on the shelves. I start reeling off titles of YA books with male main characters. I'm all for writing the projects that we need to write, listening to the inner voice, and so on. I think my best projects have chosen me as much as I've chosen them. But I like to think that books also contain something for the reader: something to uplift or amuse, encourage or entertain. Something to open their eyes to new experiences, or make them feel less alone as they recognize their own experiences on the page. Something to make them feel that they haven't wasted their time; they've come away richer for the time they spent with our words. I suppose I'm talking about theme. I don't start writing with theme in mind, but I generally find the theme at some point during drafting or revision--otherwise, I sense that something's missing. Theme is the thread of coherence running through the story; theme is what makes the story make sense, gives it its significance. So often in life we don't know why things happen the way they do; we don't get the point. But with stories, it's very satisfying when we can identify the point. Okay, well, this first one's actually still me, guest blogging at tracy_d74 about the joys of traveling alone, and the importance of stepping outside one's comfort zone. In case anyone needs an etiquette reminder--or a laugh--here's a link via kimberleylittle about the strangest places editors have been pitched by aspiring authors. Erin Murphy visits the Shrinking Violets, to discuss the true meaning of success. Ever had a series canceled before the last book? Stacey Jay solves the problem by finishing her Megan Berry zombie series with an indie novella. But if the novella does well enough, Megan Berry's adventures just may continue. Laurel Garver posts about finding a use for all those character sketches, deleted scenes, and extinct subplots that are the inevitable byproduct of revision. And Elissa Cruz reveals The Secret to Successful Revision! We learn how to write while sitting at a desk: in a classroom, at home with a notebook, in a critique group, at a café table with your computer. More than any other art, writing is about sitting in one place and doing the work. More than any other art, writing is also about life. Without life, there is no writing. Every experience you have, every person you meet, every scent you smell, and every food you taste contributes to the intricate web of who you are and what you write. Reading is not enough; if you only write about what you’ve read, you’ll only reiterate what’s already been said. There’s no substitute for a good life. One of the coolest things I’ve ever done was go to an Indian color festival. Everyone bought bags of colored flour and threw them at each other until hundreds of people were drenched in rainbow slashes under a cloud of stunning color. I’ve never seen anything like it. Here’s another example of a cool experience: Once my best friend was deathly ill on a sight-seeing trip in Rome. By the time she got to the Trevi fountain, she couldn’t go any farther. She curled up in one of the crevices in the rock and fell asleep for half an hour until a security guard made her move. She’s probably one of the few people in the world to sleep on the Trevi fountain. When my husband was a teenager, he and his friends liked to cover other people’s houses in toilet paper. Once an owner chased them out with a shot gun and called the police. They spent several hours running through the woods away from the cops, and at one point, my husband lay face down in the dirt while a cop stood only a foot away and shined his flashlight right over him. Even if we don’t write about these experiences, they’re valuable experiences that will bleed into our writing. I learned about dazzling color, my friend learned about spontaneity, and my husband learned about adrenaline. We can use all of this. My challenge to every writer is to go out and live. Fall in love. Get in a fight. Do something dangerous. Learn a new skill. Listen. These are the building blocks of our work, and the more incredible the building blocks are, the more incredible the writing will be. Teralyn Rose Pilgrim is the author of the unpublished novel Sacred Fire, historical fiction about the Vestal Virgins of ancient Rome. She blogs at http://teralynpilgrim.blogspot.com/. Bookstores/libraries will never carry this. People will send me hate mail about this. What is my mother/son/wife going to think when they read this? What if nobody wants to read about this? The inhibiting voices buy into the notion that there are only some subjects that can be talked about, and they can only be talked about in certain ways, within certain guidelines. And yet, human experience is so vast. Are we really so fragile that we must limit what we read or discuss? And does it make sense to shut off entire spheres of human experience from our literature? Sometimes, the writer reaches a point where silence becomes more painful than speech, no matter what consequences arise from speech. People who imagine that writers tackle difficult subjects out of a desire to shock or get attention are, so often, 180 degrees from the truth. Although there is tons of free poetry floating around the internet, and you may have poetry books sitting on your shelves now that are ripe for rereading, I'm encouraging you to buy. The point is to show the kind of economic support that poetry doesn't often get. Of course, if you really can't afford to buy, then I suggest checking out some poetry from your local library, because library circulation statistics are also helpful in supporting poets. --There are wonderful experiences waiting for you in poetry. And if you've never tried a verse novel, they are so much fun to read--it's an exciting format right now, especially in YA. --Poetry changes the way we look at language. --Poetry changes the way we look at the world. My choice for the challenge (because of course I am taking my own challenge!) is Blue Lipstick by John Grandits, which is on its way to me right now. I've been having an email exchange with someone about "open" endings in books. They can be tricky for readers to accept, since human beings generally like two things in story endings: justice and resolution. But some readers are open to endings that are unhappy, or uncertain, or ambiguous. The world is in short supply of justice and resolution, and while many readers want those things in books as an antidote to that harshness, other readers hunger to see that truth reflected in their literature. They find comfort in the fact that literature can say: Yes, this is difficult; no, it's not fair or right. Or, I don't have all the answers either, but here is what I know to be true. An "open" ending shouldn't drop the reader off a cliff, and shouldn't be based on the writer flinging up her hands and saying, "I've run out of ideas; I don't know what happens next." An open ending should be as carefully planned as any other part of a book. I have great news for you. I mean, I hope that you will think it's great news. And then, early next year, Viking will publish another of my novels. 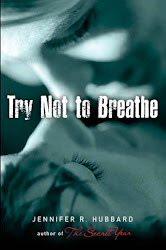 It's another contemporary, realistic YA, currently titled Try Not to Breathe. Now, don't get that worried look. You are my first published book, and you will always be special to me. I loved you in hardcover and I love you in paperback, and I will love you when your electronic version appears. But you must know, I was always planning to have other books, too. It doesn't mean I love you any less. That's the great thing about an author's love: it doesn't lessen, but grows to encompass every new book. And you can be a good big sibling--take the new books around, show them the ropes. They will look up to you. You won't even have to change any diapers! I appreciate all the comments on yesterday's guest post. If you haven't read it yet, please treat yourself to Becky Levine's wise words about how we never stop learning. In other blogger exchange news, I'm over at Teralyn Pilgrim's blog today, talking about fancy notebooks and why one should write in them, instead of saving them for a special occasion. --Memory. The memory may be triggered in a very obvious and literal way--that is, the character dreams about something that actually happened. The memory may be something of which the character has always been consciously aware, or it may be a forgotten experience that resurfaces in the dream. On the other hand, the memory dream could be cryptic, requiring interpretation. Mary Anderson's Step on a Crack is a good example of the cryptic memory dream as a plot device. --Revelation. The dream may reveal something to the character about herself (this sort of dream occurred in Alicia Thompson's Psych Major Syndrome). Often it reveals even more to the reader about the character's true state of mind. For example, you could have a character who insists her life is sunny and smooth, but she has horrifying dreams that signal something is really bothering her. 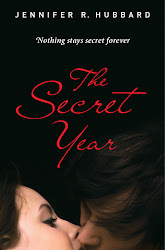 I used a variant of the "revelation" dream in The Secret Year: the main character has a couple of dreams about the girl he was involved with, dreams in which the shock of her death is expressed more overtly than he can do when he's awake. --Prophecy. This is more common in paranormal literature: the character predicts future events in dreams. In a variant of this, the character may receive messages or clues in a dream. Often, the dreams are cryptic and the character must figure out what they mean. --Control. Carrying the prophetic dream even further, the character actually changes and controls the environment through his dreams. Right off the bat, this concept has a lot of potential for a fascinating story. In all cases, the dream--like any other scene--has to advance the plot or deepen the characterization (or ideally, do both). It should also arise organically, rather than as a device of convenience (not, "How should I have her find out about the key? I guess I'll just have her dream about finding it in the toilet tank, and then when she looks--there it is!"). The dream should introduce material that can't easily be conveyed some other way, or wouldn't be as interesting or natural if it were conveyed in another way. Of course, even as I suggest these guidelines, I know there must be a million exceptions, as always. Have you ever used dreams in a story, or seen another writer use them effectively? If so, how?